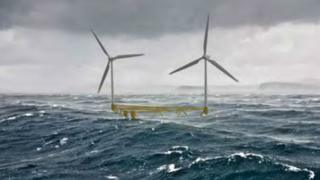 A plan to install two floating wind turbines off the north Caithness coast has been approved by Highland councillors. A Swedish firm has sought permission from Highland Council, Orkney Islands Council and the Scottish government for the demonstration project. Melvich Community Council has opposed the proposal because of concerns it would ruin views across to Orkney. The proposed site is about three miles (6km) out to sea from Dounreay. The developer, Hexicon AB, has set up Dounreay Trì Limited to develop the project. The scheme would also involve laying a subsea cable and building a substation. The plan has still to be considered by the Scottish government. Marcus Thor, prroject Director for Dounreay Trì Limited, said: "We are delighted that the council has agreed with this project and hope that Marine Scotland and the Scottish government can take a timely decision on it. "This demonstration facility which will be built and operated in Scotland opens up the possibility for a significant increase in offshore wind generation and associated supply chain benefits in Scotland." WWF Scotland's director Lang Banks said floating turbines could potentially provide Scotland with "clean power" in the future.